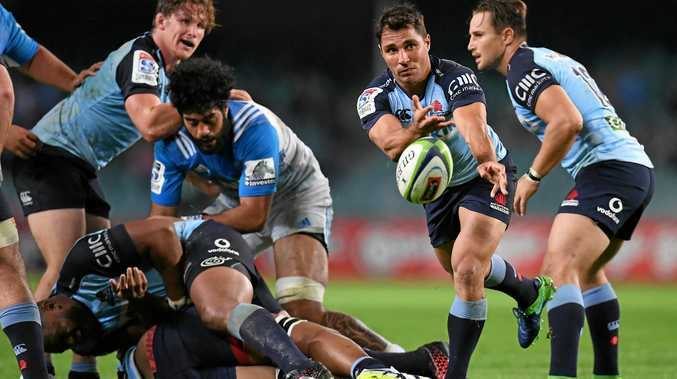 STOPPING Rebels enforcer Sean McMahon and playing for 80 minutes are the keys for the Waratahs if they are to feature in this year's Super Rugby finals. Miraculously the Waratahs, who have just three wins from 10 starts, still hold hope of topping the Australian conference and thereby qualifying for the playoffs due to SANZAAR's wacky competition structure. But any hope of featuring in the final eight will surely be lost if they don't snap their four-match losing streak at home against Australia's bottom-placed franchise, the Rebels, on Sunday afternoon at Allianz Stadium. "We need to be unbeatable for the next five games, and it's as simple as that,” coach Daryl Gibson said on Thursday. The Waratahs have conceded 213 first-half points this season, a competition high. It's meant that the Waratahs have been left playing catch-up rugby throughout their campaign. If the Waratahs can turn that around, Gibson believes they will morph into an "unbeatable” force. "We're really searching for that performance,” Gibson said. "We're an excellent team for 40 minutes but really our focus is to be an 80-minute team, and when we do that, I believe we can be unbeatable. Making the Waratahs' challenge on Sunday all the more difficult is the likely inclusion of Wallaby back-rower McMahon. The 22-year-old made an impressive comeback via the bench last Saturday during their 29-24 loss to the Reds. McMahon is the heart and soul of the Rebels and his robust performances have been sorely missed this year. In his absence, Japan international Amanaki Mafi has been left to do the heavy hitting, particularly given Lopeti Timani's injury and suspension woes. But having served his four-week ban for kneeing, six-Test Wallaby Timani is also likely to return to further bolster the Rebels. Gibson knows stopping their go-forward is paramount. "I believe getting back Sean McMahon (is a threat we must stop),” Gibson said. "I imagine he will start. "He's certainly a player with immense power and we've got to make sure we deal with that. "I thought Mafi's been excellent all year. Gibson has made four changes to his starting side, which went down 40-33 to the Blues a fortnight ago after a disastrous first half in which they let their New Zealand rivals to lead 26-0. The merry-go-round in the No 9 position continues, with Wallaby Nick Phipps replacing Jake Gordon. Gibson said Phipps' recall to the starting side was reward for putting in the hard yards at training. "I thought he was impressive off the bench against the Blues - came on and made a real impact and he's really earnt this,” Gibson said. "He's been putting in a lot of time behind the scenes, really working hard at his game and that's starting to pay off for him and I believe he deserves an opportunity to start the game. "Getting back to working really hard at his craft (is the reason behind his return to form). Giant Test lock Will Skelton returns to partner Dean Mumm in the second row, after what Gibson described as the Saracens-bound forward's best performance in a blue jersey in two years. Elsewhere, Taqele Naiyaravoro returns on the wing and Michael Wells comes in for Jed Holloway at No.8.